The “Preferred Motorcycle” of the Shrine of North America! is truly Harley-Davidson. 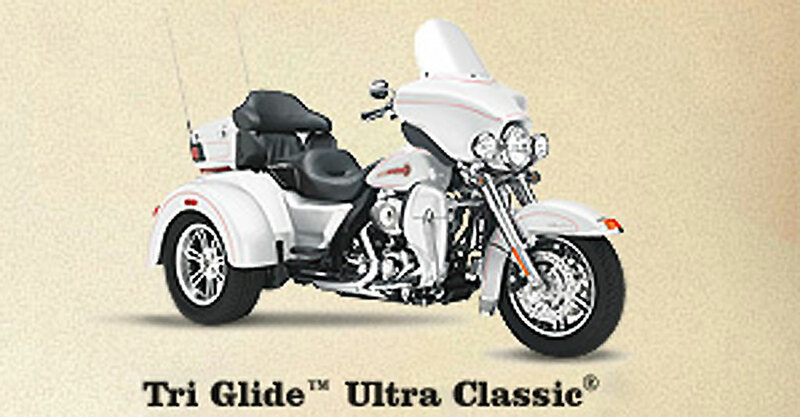 The Tri Glide™ Ultra Classic® Trike features ultra-comfortable, long haul conveniences, a large Twin Cam 103™ engine, lengthened and raked front fork with steering damper, a deluxe Tour-Pak® carrier and integrated trunk for 6.5 cubic feet of storage. This three-wheeled pioneer is designed, developed and tested to the highest standards of the Motor Company and backed by over a hundred years of touring mastery. This is not a bolt-on, aftermarket Trike kit. It’s engineered and road-tested as a whole. Every inch is integrated for comfort, cargo and confidence. 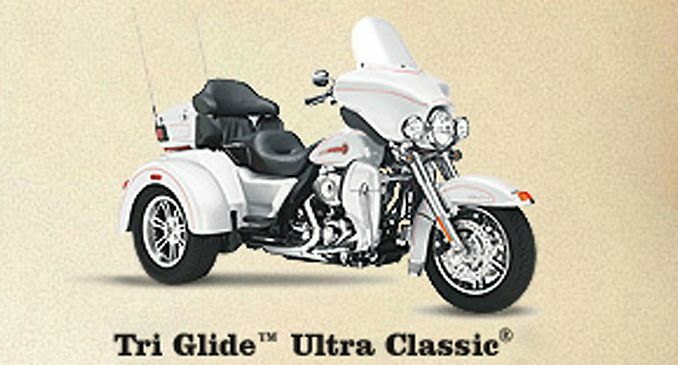 From the smooth, classically designed lines to the front-to-rear matching paint, the Tri Glide® Ultra Classic® model has the bloodlines of a true Harley-Davidson® motorcycle through and through. With a total cargo capacity of 6.7 cubic feet and up to 80 pounds, the Tri-Glide Ultra model puts the “haul” in long haul. The integrated trunk offers 4.4 cubic feet and 50 pounds of storage capacity, while the waterproof, injection-molded Tour Pak® keeps things classy and neat with soft woven-nylon luggage liners, plenty of storage pockets and distinctive, wrap-around rear lights. So head out cross country or to Biketoberfest knowing you’ve got the capacity to turn luxury touring into luxury living on the road. Designed by Chief Styling Officer Emeritus Willie G. Davidson, the nimble, fork-mounted Bat-Wing fairing first appeared on the touring scene back in 1969. And it continues to evolve and symbolize the essence of Grand American Touring more than forty years later. The full 8-inch windscreen gives it a classic touring profile and added protection. Add to it the full, clear Lexan® windshield and adjustable, smoked Lexan® air deflectors on the fairing sides and the wind is simply not a factor for the mile-hungry rider who wants to soak up the freedom of the open road for days on end. The knowledge of what makes an engine truly move a rider runs deep at The Motor Company, and it was put to good use when we created the Twin Cam 103™ engine. We worked to perfect every cubic inch, pushing design and technology forward. And we did it all without compromising one bit of Harley-Davidson’s unique styling. Evolved, yet carrying on the legacy of the Flathead, Knucklehead, Panhead, Shovelhead, Evolution®, Twin Cam 88® and Twin Cam 96™ engines that came before. The performance and durability are a direct result of the untold miles logged on the V-Twin since 1909, and the proud heritage that comes from a century’s worth of commitment to life on two (or three) wheels. Feast your eyes on the Twin Cam 103™ engine and there’s no mistaking its roots. This is authentic Harley-Davidson style through and through with an attention to detail you won’t find from any other motorcycle company. Black powder-coated cylinders and cylinder heads with machined cooling fin tips are topped off with chrome rocker covers, while chrome pushrods highlight the iconic V-Twin. It’s a jewel machined out of metal. Pure. Dripping with power. From the classic edge of the cooling fins to the clean lines of cases and covers—the Twin Cam 103™ engine makes an ironclad statement to holding on to what’s right and staying true to what satisfies the rider. Naturally, the king of the road gets some royal extras. This four-speaker, 20-watt per channel premium Harman/Kardon® advanced audio system boasts great sound for booming down the boulevard and highway, and, yeah, it might as well go to 11. It’s loud, proud and comes with AM/FM receiver, CD and MP3 player, four speakers—even an intercom and CB. When it comes to hearing your tunes over the roar of the road or just keeping your own chatter free and easy, this system has it all. Beyond its capacity, comfort, head-turning looks and that broad band of power, you can enhance your Tri-Glide Ultra model even more by taking advantage of the exhaustive catalogue of Harley-Davidson add-ons and accessories. The accessory connector sits discreetly under the rider seat, making it easy to plug in and reach whatever you envision adding to your Trike. If you’re ready to take Touring to the next level, the cruise control feature will help you settle in for the long haul. Get the comfort of the cruise without the cables cluttering up your handlebar. Our electronic throttle control technology makes it possible to have the best of both worlds. A long, raked out fork makes sure the Tri Glide® Ultra Classic® model rides as smooth as it looks, offering reduced effort for steering. Plus a steering damper controls feedback from the road. 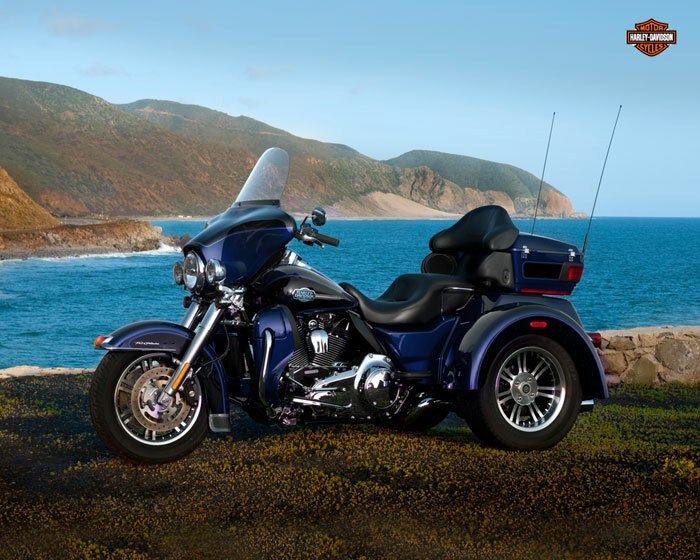 So when you’re out with your bagger buddies, you’ll stay right at the front of the pack. Classic style and maximum comfort. That’s the perfect balance of the wide set handlebars that come standard on the Tri Glide® Ultra Classic® model. They’re designed to keep you comfortably propped in a commanding position while making sure your neck muscles stay calm and relaxed mile after mile, state after state. Durable stainless steel insures the structural rigidity you expect from a Harley-Davidson® motorcycle with the deep, lustrous finish you desire. Designed and tested to deflect heat generated from the V-Twin, the mid-frame air deflectors are enlisted for duty on every ride, especially the hotter days. These low-profile black deflectors are mounted to the frame of the Tri Glide® Ultra Classic® model just below the seat, and move the heat away from your legs and body. Summer rides just got more comfortable. Don’t be a prisoner to the elements outside—take control of your ride with the color-matched fairing lowers on the Tri Glide® Ultra Classic® model. Pop them off for a cooler ride or leave them fixed to fight the wind tooth and nail. Use the integrated glove boxes to empty your pockets, ditch your phone, and ride free. When it comes to touring, Harley-Davidson is all about optimal comfort every time you hunt down a horizon.